Official description They're all here! Defeat every single fighter without a break! If that's not an "ultimate battle," then what is? They're all here! Every single fighter! If this battle's not "ultimate", then what is? For Reward Clear on hard difficulty. The Ultimate Battle is a co-op event match in Super Smash Bros. for Wii U. Both players must choose a character and take on all playable fighters (excluding Mii Fighters and DLC characters) in the game. The order of the characters go from clones, to unlockable characters in Super Smash Bros. for Nintendo 3DS, third party characters, and starters. Each of these groups are ordered from newcomers to Brawl veterans, Melee veterans, and Smash 64 veterans. This event is unlocked by clearing Final Battle Team-Up and unlocking all characters. Completing the event does not unlock any further paths. 10000G is awarded for clearing this event on hard difficulty. 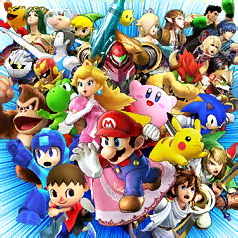 The event icon resembles the boxart for Super Smash Bros. for Wii U with more characters. This is the only Co-op event to involve Jigglypuff, Shulk and Sheik, as they are not played as or fought in any other Co-op events. After Hungrybox tweeted out a picture of The Ultimate Battle, speculation arose that the event was "teasing" the upcoming Super Smash Bros. Ultimate, due to its name, and the event description saying "They're all here! "; however, as the name in Japanese also translates to "The Ultimate Battle", and the name of Ultimate in Japan being Super Smash Bros. Special, the naming connection between the event and the game is purely coincidental. This page was last edited on October 28, 2018, at 16:46.